Women of the World Tac Pin. Join hands with other women around the globe in business and show your support for women in business. This pin would also be cute for pen pals or groups of friends celebrating friendship. Embrace sisterhood around the world. 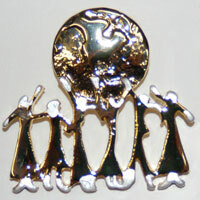 This pin features 6 women pointing to or holding up the world or globe of this earth and Measures approx 1.25 x 0.25 inches.